Waterproofing leather conditioner. 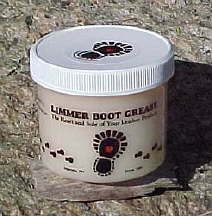 One 4 oz container of the Limmer Boot Grease approximately 35 applications if applied with brush or rag. Works. Been using it for a good 15 years on every pair of boots I wear. I work outside every work day, 12 months a year and applied per the instructions, your boots will shed water like a ducks back.